Relatives of the Yak-42 pilots involved in a fatal accident at Yaroslavl in September 2011 dispute the official findings on the causes of the accident in a Russian court. 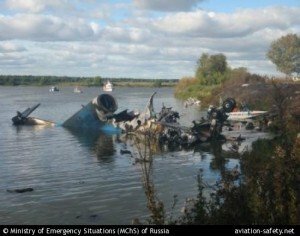 On September 7, 2011 a Yakovlev 42 passenger jet carrying the Lokomotiv Yaroslavl ice hockey team crashed on takeoff. Forty-four occupants died; just one passenger survived the accident. The investigators of the MAK Interstate Aviation Committee (IAC) concluded amongst others that the wrong V1 speed had been calculated and that the airplane failed to accelerate because one of the pilots inadvertently pushed the brake pedals. A document disputing the conclusions was submitted to the Zamoskvoretskiy court of Moscow. Relatives of the captain and copilot believed, on the basis of “expert legal analysis”, that the crash investigation was conducted in violation of ICAO standards and recommended practices. In addition, according to defense, the Interstate Aviation Committee was interested in the outcome of the investigation. The conclusion about the application of brake pedals was refuted because it was “not based on any legal documents”. The document also challenged the findings that the airplane stalled due to a critical angle of attack because this critical angle was not recorded by the flight data recorder.